Learn how to make herbal infusions by combining oils and vinegar with herbs from your backyard. Use them in cooking, cosmetics, and more. Making your own infused oil and vinegar is a lot cheaper than buying them at the store. You can also infuse oil with herbs and use them to make healing salves, creams, and massage oils. I recently made basil oil which I intend to keep at the side of my stove with a pour spout. This way it will be right there when I’m cooking. I also made calendula oil which is great for making skin treatments like dry oil body spray, salves, and balms. 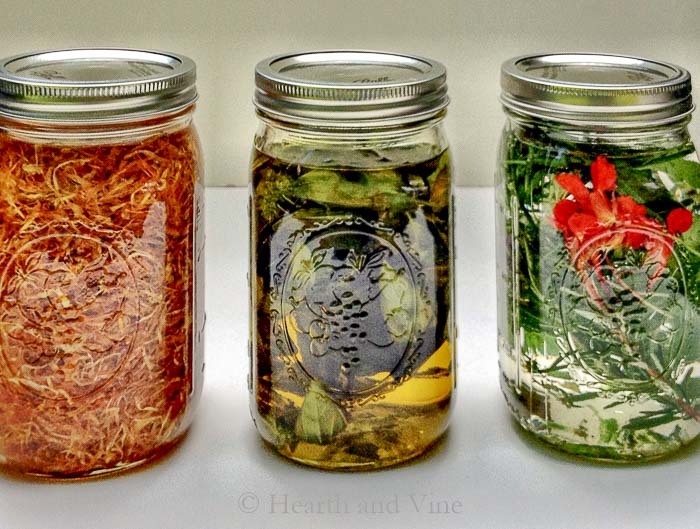 The third jar shown above is herbal vinegar using white wine vinegar and a mix of herbs from my garden. I added a few nasturtium flowers which have a peppery taste and nice color. Herbal vinegar makes a beautiful gift and you can choose from a wide variety of combinations of herbs and vinegar bases. For example, you can use cider vinegar as a base which is good for cosmetic use such as a hair rinse to remove product build-up, or as an astringent for your face. Just make sure to dilute it with a little water first. Place them in a quart jar . Add oil or vinegar to the top of the jar. Make sure to completely cover the herbs. Let steep for a couple of weeks or longer in a warm dark place. I suggest running your jars and bottles through the dishwasher first. Although I love garlic (who doesn’t) I steer away from using it because of the possibility of botulism. Keep only a small supply. Oils can turn rancid, some quicker than others. You’ll know because it will smell bad. Refrigeration helps but then they solidify. In that case, you’d have to set them out ahead of time to use them, and well, you’re probably less likely to use them that way.